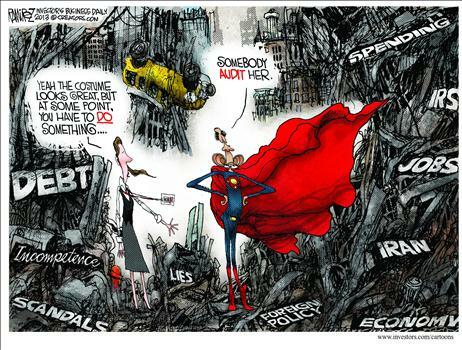 It’s a Bird, It’s a Plane…It’s Stupor-Man! Last year, I shared a potential slogan for Obama’s re-election campaign (followed by a warning about the big challenge he would face if victorious). Now we have a new Michael Ramirez cartoon that has a similar theme. You can see why Michael Ramirez was the winner of my political cartoonist contest. He conveys so much with a single image. He won for his “Julia” cartoon, but he just as easily could have prevailed for his gem about Obamanomics, his European lemming cartoon, or his masterpiece on taxes in the Garden of Eden.